The Xinjiang Uyghur Autonomous Region is territorially the largest administrative unit of China1, covering around one sixth of the country’s total area, and neighboring eight independent countries (Afghanistan, India, Kazakhstan, Kyrgyzstan, Mongolia, Pakistan, Russia, Tajikistan). The region was under the spotlight of the world during the summer of 2009 when clashes between the two major ethnic groups, Uyghurs and the Han Chinese, left around 200 people dead in Urumqi. In their attempts to explain the violence in Xinjiang, most analysts overplayed the ethnic factor, largely ignoring the socio-economic context within which the ethnic structure of the region should be evaluated. Evidence suggests that the leading cause of the instability in Xinjiang is not the failure of different ethnic groups to coexist, but mainly the relative economic backwardness of the region, which results in large income disparities between these groups, creating a fertile ground for unrest, one that is further worsened by the ethnic policies adopted by the central government in Beijing. In order to understand Beijing’s determination in economically developing Xinjiang, we need to go beyond the ethnic issues and consider the case of Xinjiang within the larger framework of China’s economic security. The Chinese economy is growing rapidly and so are its requirements and needs, including but not limited to raw materials and resources. Xinjiang’s geographical position as China’s gateway to Central Asia and its endowment of natural resources make it an important actor in this respect. In order to illustrate this argument, this article will first discuss what economic security means in the Chinese context, provide brief background information on Xinjiang’s economic development, and then proceed to evaluate the region within the Chinese context in order to assess to what extent Xinjiang contributes to the overall economic security of China. In this way, this article hopes to shed light on the motivation behind the Chinese government’s intensive efforts for developing this region. The question is, why does Beijing invest in Xinjiang? Is it because Beijing wants to improve the living standards of the people living in Xinjiang? Is it because Beijing wants to prevent ethnic separatism in Xinjiang? Is it because Beijing wants to establish a buffer against Central Asia? Is it because Beijing wants to source raw materials from Xinjiang for the rest of the country? Whereas all of these questions can be responded to in the affirmative, Beijing’s motivation for investing in Xinjiang should be evaluated within the larger framework of the “economic security” concept. This paper argues that Xinjiang’s development is of vital importance for the central government because this region is playing a key role vis-à-vis the economic security of China. Before moving to elucidate this argument, we will first discuss what economic security means in the Chinese context. Another development with regard to the literature on economic security was the diversification of regions analyzed. Whereas in past decades scholars mostly dealt with developed countries and particularly the United States, there emerged lately a greater interest in the developing parts of the world, where globalization and the challenges it brought led to a redefinition of the economic security concept in an on-going process. China is one of the countries where this redefinition has been most dramatic, since in China globalization has coincided with the opening up of a socialist economy and the consequent rapid growth. China’s economic growth is remarkably impressive by any measure and it is fair to say that China’s growth is one of the most important factors shaping today’s global economy. However, on the other side of the coin, the issue of economic security raised by China’s rapid growth remains as a major concern, both for the government and the academia. In sum, it can be argued that for China and its rapidly growing economy, economic security means sustaining its growth rate, welfare, and economic power. This is to be achieved by ensuring access to export markets, securing sources of raw materials, especially strategic minerals and hydrocarbons, keeping the import routes open, and preserving macroeconomic stability. The question is then to what extent Xinjiang contributes to this picture, however, before dealing with this question this region’s economic development needs to be evaluated within a historical perspective. Throughout history, Xinjiang’s economic development has been shaped by a strong confluence of environmental and socio-political factors.17 On the environmental side, the remote and land-locked position of Xinjiang and its inhospitable environmental features emerged as significant obstacles against the economic development of the region.18 However, offsetting these disadvantages, the region is rich in natural resources, including hydrocarbons. The socio-political side, on the other hand, is more complex, and it is related to the complex ethnic composition of Xinjiang. The single largest ethnic group in Xinjiang is the Uyghurs whereas other major non-Han ethnic groups include the Kazakhs, Kyrgyz, Uzbeks and Tajiks, all of whom have kinsmen in the neighboring Central Asian republics of the former Soviet Union.19 As a matter of fact, economic development of Xinjiang cannot be evaluated separately from the ethnic issues involved. The discussion of economic development in Xinjiang should begin with the Qing Dynasty period. After incorporating Xinjiang as a province into the Chinese empire in 1884, the Qing Dynasty embarked upon an aggressive program of economic development. Agriculture began to be commercialized with a significant expansion of cultivation throughout the region, and there was also progress in other areas of the economy, such as the rise of handicrafts, coal and oil extraction (with Russian assistance) and flourishing foreign trade, which also benefited from the British-Russian imperial rivalry in Central Asia. The Great Leap Forward and Cultural Revolution periods under Mao Zedong were marked by what Michael Clarke called a “contradiction created by the policy directives from Beijing and what was actually practicable in Xinjiang’s conditions”.25 Policies were implemented and targets were set without regard for the local conditions of Xinjiang and they were characterized by ideological influence that took mainly anti-Islam and anti-Soviet forms in Xinjiang. There was, however, some economic progress, albeit limited. In 1977, Jack Chen argued that China was industrializing without an exodus from the farms to big cities. He compared the rural population ratio of 87% in the unindustrialized China of 1949 with 80% in 1977. Chen was also pointing of a modernization of the economy, stating that the share of modern industry in the total value of industrial production in Xinjiang had risen from 2.9% in 1949 to 78% in 1977.26 As Chen was writing these lines, Deng Xiaoping rose as the leader of the post-Mao China, bringing greater liberalization to Xinjiang. What was remarkable in this period was China embarked on a series of market-oriented economic reforms within the framework of what is called the “socialist market economy”, a system where the state owns a large part of the economy and at the same time allows all entities to participate within a market economy. After 1991, liberalization of China’s foreign trade regime that coincided with the independence of the Central Asian republics led to a rapid growth in trade between China and Central Asia. This growth was not limited to the bilateral state level, but there was also growth in local trade between Xinjiang and the Central Asian republics in the form of border trade, border residents markets and tourist purchases.33 In sum, China’s strategy was to establish a buffer, while at the same time to benefit from larger amounts of cross border commerce. Infrastructure development (focusing on expanding the highway network and building more railway tracks, airports, gas pipelines, power grids, telecommunications networks). Environment (projects to protect natural forests along the upper Yangtze River and the upper and middle reaches of the Yellow River). Local industry (encouraging different regions to develop industries that maximize local comparative advantages in geography, climate, resources and other conditions; capitalizing on high-tech industries). Investment environment (taking steps to attract more foreign investment, capital, technology and managerial expertise by improving industrial structure and reforming state-owned enterprises). Within the framework of this strategy, cumulative fixed investments in Xinjiang totaled 1.4 trillion yuan36 over the period between 2000 and 2009, more than 80% of which coming from the central government.37 During this period, Xinjiang received four times as much investment as it had during the 1990’s, and investments were mainly made in infrastructure projects in agriculture, forestry, energy and transportation sectors. Despite its problems and setbacks, Xinjiang is currently on a development path. The next section of the article will examine what this development means for China’s economic security. Given its radical transformation and rapid growth rate, China is obliged to take the necessary measures to deal with collateral macroeconomic disturbances (such as unemployment, income equality, etc), and to ensure its continued access to world markets where it can sell its products. Since it relies to a great extent on imports of raw materials to fuel its economic growth, China has to ensure continued inflow of such supplies as well, while at the same time maintaining its economic independence, which is achieved by avoiding excessive reliance on a single source of imports and diversifying the sources instead. In this part of the article, we will discuss to what extent Xinjiang contributes to China’s economic security in the each of the areas mentioned above. Xinjiang remains far behind the eastern provinces of China in terms of average incomes. In 2009, when Chinese GDP grew by 8.7% and most central and western provinces of the country achieved double-digit growth rates thanks to the stimulus package launched by the government as a measure against the effects of the global crisis, Xinjiang’s GDP rose by only 8.1%. In sum, from a macroeconomic perspective, Xinjiang has a negative yet improving position as far as China’s economic security is concerned. Its economic backwardness relative to the more developed provinces can be regarded as major concern, whereas unemployment and rising inflation continue to pose a problem. Economic interdependence means that all countries are dependent on others to some extent for one kind of supplies or another. This implies that interruptions in imports of the supply can severely disrupt the national economy and also overseas suppliers can acquire a monopoly position turning the terms of trade against the importer. Vincent Cable argues that these two arguments usually go together and they are especially evident in the areas of food, strategic minerals (those used in industries regarded strategic such as aircraft production), energy (esp. oil and gas) and advanced technology.45 Food supply and energy supply are often defined as the most crucial determinants of China’s economic security, together with the macroeconomic disturbances discussed above. As the economy of China grows, so does its need for supplies of raw materials and resources, and security of supply becomes an increasing concern for the decision makers in Beijing. This part of the article will start with two areas of supply security, namely energy security and food security, the first associated with the needs of a growing economy and the latter with the needs of a growing population. Additionally, a third area will be discussed, which is of vital importance for China’s textile industry, namely cotton. Energy. Due to the high rate of economic growth in China, demand for energy outstrips local supply and there is an increasing reliance on imports, although China is the world’s fifth largest oil producer with a production volume of 189 million tons in 2009.46 After 1978, as the oil consumption of the major economic powerhouses in the world (United States, Europe and Japan) almost remained constant, China’s consumption nearly quadrupled. Dependence on imports is by itself an economic security concern, which is further heightened by the volatilities in global energy markets and political instability in the world’s energy producing regions. China is currently dependent on imported oil. Until 1993, it had been self-sufficient in this respect, even producing a surplus. However, after this year consumption increased faster than local production and the resulting gap is widening every year. The local production/consumption ratio, which was 120.8% in 1992, declined below the self- sufficiency line in 1993 with 98.8% and continued to decrease, to 72.7% in 2000 and to 46.7% in 2009.47 This means that today China is producing less than half of the oil it consumes and for the rest it depends on imports.48 As this ratio falls, imports increase (in 2009, China’s imports of crude oil rose by 13.8%), and so do the economic security concerns. There is, however, a different picture as far as other energy sources, i.e. natural gas and coal, are concerned. China consumes gas and coal as much as it produces them, not more. In other words, China is self-sufficient in gas and coal. As a region within China, Xinjiang’s contribution to the country’s energy supply security takes two forms; first as a producer of energy resources, and second as a transit route of energy resources imported from abroad. Xinjiang has a key position in China’s oil supply security, not only because it is the third largest producer of oil among China’s provinces, but also because it functions as a transit route. Due to its strategic concerns over relying too heavily on maritime imports of oil, China has a significant interest in securing oil supplies through pipelines from Central Asia. Since Xinjiang is the only region in China that is neighboring the Central Asian republics, Central Asian oil (and a large proportion of Russian oil) has to enter the Chinese pipeline network from Xinjiang. The first transnational oil pipeline built for this purpose was that of the Sino-Kazakh Oil Pipeline Co. Ltd.55 which began pumping oil in July 2006. This pipeline starts in Atasu in northwestern Kazakhstan, enters Xinjiang territory at Alashankou on the Kazakh-Chinese border, and terminates at PetroChina Dushanzi Petrochemical Company. Half of the oil transported through this pipeline is Kazakh oil and the other half is Russian oil. When this pipeline reaches its full capacity of 20 million tones per year, it will account for around 15% of China’s oil imports. In the mean time, the oil extracted in or imported through Xinjiang is distributed to the rest of China through the Urumqi-Lanzhou oil product pipeline and the Shanshan-Lanzhou crude oil pipeline. Although China is to a great extent self-sufficient in terms of natural gas, the government is planning to import Central Asian gas in order to ensure long term economic security and meet the rapidly increasing demand for cleaner burning fuel. To that end, China inked a 30-year deal with Turkmenistan in 2006 for 10 billion cubic meters of gas per year, rising to 30 billion by 2012. The Kazakh part of the pipeline, which will carry the gas coming from Turkmenistan via Uzbekistan will link Shymkent on Uzbek-Kazakh border to Khorgos in Xinjiang, and will have a capacity of 40 billion cubic meters per year. The gas arriving in Xinjiang will be distributed to the rest of China through the 4,200-kilometer West-East Pipeline linking Xinjiang to Shanghai in the east and a second line of 4,843 kilometers that connects Xinjiang with Guangzhou in the southeast. Gas is important for China’s economic security, because abundant supplies of natural gas will help to overcome China’s dependence on coal. Coal is a basic energy source in China making up 70% of the country’s total primary energy consumption,58 and as discussed above, China is self-sufficient in terms of coal supplies. China is the largest coal producer in the world, with a share of 45.6% in the world’s total production as of 2009, and at the same also the largest consumer, with 46.9%.59 In other words, almost the half of the world’s coal is produced and consumed in China. 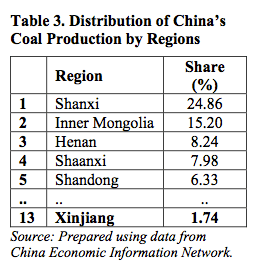 Although Xinjiang is not one of the major coal producing regions in China (see Table 3), it is rapidly growing its coal industry and making preparations for exploration of large- scaled coalmines. Currently, coal resources already utilized only account for 13% of total deposits. An important portion of the unutilized resources is to be found in Xinjiang. Food. Food security should be dealt with within the larger framework of agriculture in Xinjiang. 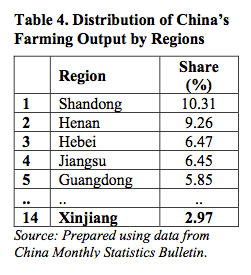 Stockbreeding and pastoralism dominate the region’s economy, however it is not possible to argue that agriculture is well developed in Xinjiang, mainly due to climatic and geographical problems. There are severe irrigation problems in grasslands and deserts, as well as occasional droughts, which seriously undermine the agricultural output. As a result, although its economy is dominated by agriculture, Xinjiang is not one of the leading producers in China, and therefore its contribution to China’s food security is minimal. In 2007, the total value of China’s farming output was 2.15 trillion yuan, whereas Xinjiang share in this was 2.97% with 63.9 billion yuan. 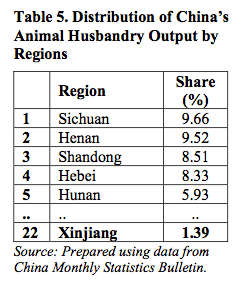 Similarly, in China’s total animal husbandry output value of 1.36 trillion yuan, Xinjiang’s share was only 1.39% with 18.9 billion yuan (See Tables 4 and 5). Fruit, especially melons and grapes, are often regarded as the most important farming product in Xinjiang. A closer look at production levels of various farming products reveals that although this is true, Xinjiang is still not one of the major producers of fruit in China. 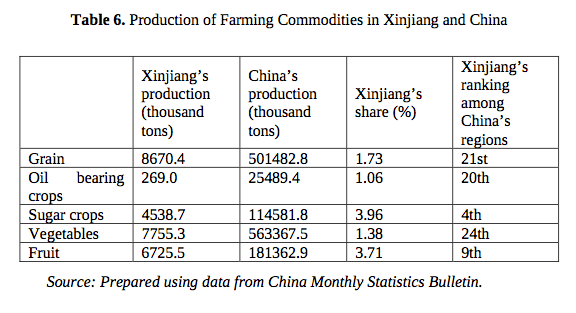 The data in Table 6 suggests that Xinjiang’s share in China’s production of farming commodities exceeded 3% only in fruit and sugar crops. Cotton. Another agricultural product, which is not related to food security but still important in terms of China’s security of supply, is cotton. China’s competitiveness in the textile industry is derived from its low cost base. While labor costs are crucial in this respect, there is also the need for low-cost raw materials, in this case cotton. 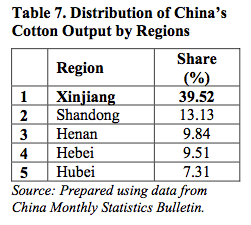 As discussed earlier, cotton is one of the two pillars on which the Xinjiang economy is based. Indeed, Xinjiang is the leading cotton producer in China on a regional basis, accounting to around 40% of the total output (see Table 7). In 2009, the region produced 2.5 million tons of cotton, ensuring the supply security of China’s rapidly growing textile industry. In an age of growing economic interdependence, security in the economic realm is ensured not only by securing the supplies to be used for production, but also by ensuring access to markets where the output is to be sold. Export growth is an important engine of economic growth and increasing the exports requires access to markets in a sustainable manner. In our case, China can be said to capitalize on a significant level of market access and therefore economic security. This argument is supported by the fact that China’s export growth goes parallel to the growth in output, meaning that as China produces more, it also exports more, because it has sufficient access to markets. Moreover, China’s market access was consolidated after it joined the World Trade Organization (WTO) in 2001, which eliminated certain barriers to trade for China. Market access can take two forms. The first is related to the level of trade barriers such as quotas and tariffs a country is facing. The second form is the physical one, which refers to logistical and geographical issues. Since the unit of analysis of this article is the regional level, this section will be only dealing with the latter, by analyzing Xinjiang’s place in China’s foreign trade, both in terms of volume and logistics. 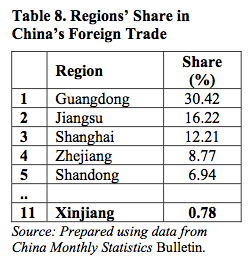 Xinjiang has only a minimal share in China’s total foreign trade. In 2009, while China’s foreign trade totaled US$ 2.21 trillion (exports US$ 1.20 trillion, imports US$ 1.01 trillion), Xinjiang’s foreign trade volume was only US$ 13.8 billion (exports US$ 10.8 billion, imports US$ 3.0 billion). This is not surprising, because, as seen in Table 8, coastal provinces of China are accounting for the bulk of China’s foreign trade.63 However, two points should be made here. First, Xinjiang has by far the largest foreign trade volume among the western provinces of China (almost 50 times greater than Tibet’s trading volume). Second, and more importantly, until the recent global economic crisis, Xinjiang has been rapidly increasing its foreign trade volume. Xinjiang’s foreign trade expanded by 50.7% in 2007 and by a massive 62% in 2008, before declining by 37.8% in 2009.64 A rapid recovery is on the way in Xinjiang, and it is safe to argue that Xinjiang is increasingly getting more assertive in foreign trade. than the traditional maritime routes departing from the country’s east coast. 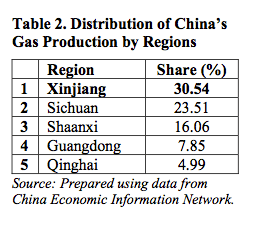 It is the single largest contributor to China’s self-sufficiency in natural gas. It is also a major domestic producer of oil, while production of coal is expected to increase drastically in a decade. Furthermore, it is the transit route of energy resources imported from abroad, which will play an increasingly crucial role in China’s supply security. As China’s gateway to Central Asia and beyond, its strategic importance vis-à- vis China’s foreign trade is rising. It is becoming the largest hub for foreign trade with reduced logistics costs. It is the single largest raw material supplier of China’s booming textile industry. Although Xinjiang is behind most of the rest of China in terms of its share from the national income (and likely to remain so for years to come) the rest of China owes a great deal for its economic growth to Xinjiang. Apparently, Xinjiang’s economic structure fits the picture of the periphery, of which the main function is to provide the core with energy supplies and raw materials. This is precisely why the Chinese government focuses on the economic development of the region. A developed and stable Xinjiang is one of the keys of ensuring China’s economic security in the long term. Beijing cannot take the risk of instability in a region, which produces its energy supplies and cotton, serves as a major foreign trade hub, and hosts important transportation routes connecting China with the rest of the world are passing. Beijing’s reliance on economic development as a strategy to deal with ethnic problems cannot be denied. However, the ethnic issue is rapidly becoming a sub- component of the economic security issue in this high-growth opening-up era of the Chinese economy. In other words, Beijing wants ethnic stability in Xinjiang not only for political reasons, but mainly for a stable, and problem-free Xinjiang that is required for China’s economic security. As economic pragmatism undermines all kinds of political ideologies in today’s globalizing world, ethnic issues such as those in Xinjiang cannot be understood without incorporating the matter of economy in the larger picture. *Altay Atli, PhD Candidate, Boğaziçi University, Department of Political Science and International Relations. E- mail: altay.atli@boun.edu.tr..
Becquelin, Nicolas, “Xinjiang in the Nineties”, The China Journal, No. 44, 2000. Buzan, Barry, “New Patterns of Global Security in the Twenty-First Century”, International Affairs, Vol. 67, No. 3, 1991. Cable, Vincent, “What is International Economic Security?”, International Affairs, Vol. 71, No. 2, 1995. Chan, Kam-Wing, “Internal Labor Migration in China: Trends, Geographical Distribution and Policies”, United Nations Expert Group Meeting on Population Distribution, Urbanization, Internal Migration and Development Conference Proceedings, 2008. Chen, Jack, The Sinkiang Story, (New York: Macmillan Publishing Co Inc, 1977). Christofferson, Gaye, “Xinjiang and the Great Islamic Circle: the Impact of Transnational Forces on Chinese Regional Economic Planning”, China Quarterly, No. 133, 1993. Clarke, Michael, “Xinjiang and China’s Relations with Central Asia, 1991-2001: Across the ‘Domestic-Foreign Frontier’?”, Asian Ethnicity, Vol. 4, No. 2, 2003. Clarke, Michael, “China’s Internal Security Dilemma and the ‘Great Western Development’: The Dynamics of Integration, Ethnic Nationalism and Terrorism in Xinjiang”, Asian Studies Review, Vol. 31, No. 3, 2007. Cutler, Robert M., “Xinjiang – China’s Energy Gateway”, Asia Times Online, 10 July 2009, (http://www.atimes.com/atimes/China_Business/KG10Cb01.html). Dillon, Michael, Xinjiang: China’s Muslim Far Northwest, (London: Routledge, 2004). Draguhn, Werner and Ash, Robert (Ed. ), China’s Economic Security, (Richmond, Surrey: Curzon Press, 1999). Dreyer, June Teufel, “The Xinjiang Uyghur Autonomous Region at Thirty: A Report Card”, Asian Survey, Vol. 26, No. 7, 1981. Gosset, David, “The Xinjiang Factor in the New Silk Road”, Asia Times Online, 22 May 2007, (www.atimes.com/atimes/Central_Asia/IE22Ag01.html). Jakobson, Linda & Zha, Daojiong, “China and the Worldwide Search for Oil Security”, Asia-Pacific Review, Vol. 13, No. 2, 2006. Jiang, Yong, “Economic Security: Redressing Imbalance”, China Security, Vol. 3, No. 2, 2007. Lee, Pak K., “China’s Quest for Oil Security: Oil (Wars) in the Pipeline?”, The Pacific Review, Vol. 18, No. 2, 2005. Rouben Azizian (Ed. ), (London: MacMillan Press Ltd., 1998). Rui, Xia, “Asphalt Net Covers China’s West”, Asia Times Online, 15 September 2005, (http://www.atimes.com/atimes/China_Business/GI15Cb01.html). Wan, Zhigong, “CNPC has Huge Plans for Xinjiang”, China Daily Online, 20 July 2010, (http://english.peopledaily.com.cn/90001/90778/90862/7072547.html). Wang, Zhengyi, “Conceptualizing Economic Security and Governance: China Confronts Globalization”, The Pacific Review, Vol. 17, No. 4, 2004. Wiemer, Carla, “The Economy of Xinjiang”, Xinjiang: China’s Muslim Borderland, edited by S. Frederick Starr, (Armonk, NY: M.E. Sharpe Inc., 2004). Yu, Shujun, “Blueprint for a Properous Xinjiang”, Beijing Review, No. 23, 10 June 2010. “BP Statistical Review of World Energy”, June 2010. “China Builds New Silk Roads to Revive Fortunes of Xinjiang”, Xinhua News Agency, 2 July 2010, (http://news.xinhuanet.com/english2010/china/2010- 07/02/c_13380771_2.htm). “China Economic Information Network” bulletin, various issues. “China Energy: Petroleum Demand”, EIU Industry Wire, 7 February 2008. “China Monthly Statistics” bulletin, various issues. “China’s Textile Industry Output Rises 10%”, China Daily Online, 3 February 2010, (http://www.chinadaily.com.cn/business/2010-02/03/content_942 3379.htm). “China’s Xinjiang Coal Reserves Adds 18.98 Billion Tons”, China Mining Federation, 8 May 2008, (http://www.chinamining.org/News/2008-05- 08/1210233199d13585.html). “China’s Thirst for Oil”. ICG Asia Report No.153, 9 June 2008. “Country Profile China”, Economist Intelligence Unit, London, 2009. “Deutsche Bahn stoppt Güterzug-Verbindung nach China”, Verkehrsrundschau, 25 June 2009, (http://www.verkehrsrundschau.de/deutsche-bahn-stoppt-gueterzug- verbindung-nach-china-852879.html). “Gediqu chengzhen touzi qingkuang (2010 nian 1-8 yue)”, China National Bureau of Statistics, (http://www.stats.gov.cn/tjsj/jdsj/t20100921_402673820.htm). “Gediqu jumin xiaofei jiage zhishu (2010 nian 8 yue)”, China National Bureau of Statistics, (http://www.stats.gov.cn/tjsj/jdsj/t20100919_402673826.htm). “Quanguo niandu tongji gongbao – Xinjiang (2009 nian)”, China National Bureau of Statistics, (http://www.stats.gov.cn/was40/gjtjj_detail.jsp?channelid=4 362&record=7). “Rising Logistics Costs Threaten Chinese Competitiveness”, CER-China Logistics News, 30 April 2008. “SinoPetro Crude Oil & Gas Products Monthly Statistics” bulletin, various issues. “Textile, Garment Exports to Suffer Largest Drop in 30 Years”, China Daily Online, 21 October 2009, (http://www.chinadaily.com.cn/business/2009- 10/21/content_8827056.htm). “Xinjiang Development at the New Starting Point”, People’s Daily Online, 7 July, 2010, (http://english.peopledaily.com.cn/90001/90780/91342/7055962.html). 1. In this article, the term “China” refers to the People’s Republic of China. 2. David Gosset, “The Xinjiang Factor in the New Silk Road”, Asia Times Online, 22 May 2007, (www.atimes.com/atimes/Central_Asia/IE22Ag01.html). government to Xinjiang was 7.4 times larger than the investment stock in Tibet Autonomous Region. “Gediqu chengzhen touzi qingkuang (2010 nian 1-8 yue)”, China National Bureau of Statistics, (http://www.stats.gov.cn/tjsj/jdsj/t20100921_402673820.htm). 4. Barry Buzan, “New Patterns of Global Security in the Twenty-First Century”, International Affairs, Vol. 67, No. 3, 1991, pp. 431-451. Globalization”, The Pacific Review, Vol. 17, No. 4, 2004, p. 524. 10. Jiang Yong, “Economic Security: Redressing Imbalance”, China Security, Vol. 3, No. 2, 2007, p.
Review, Vol. 13, No. 2, 2006, p. 62. 16. Pak K. Lee, “China’s Quest for Oil Security: Oil (Wars) in the Pipeline?”, The Pacific Review, Vol. 18, No. 2, 2005, p. 289. 17. Carla Wiemer, “The Economy of Xinjiang”, S. Frederick Starr (Ed. ), Xinjiang: China’s Muslim Borderland, (Armonk, NY: M.E. Sharpe Inc., 2004), p.163. 18. Xinjiang lies on the northwestern frontier of China and is divided by the great range of mountains, the Tianshan. The Zhungar Basin lies to the north and the Tarim Basin, which is largely occupied by the Taklamakan Desert, lies to the south. 19. According to the most recent census (2000), major nationalities in Xinjiang are: Uyghur 45%, Han 41%, Kazakh 7%, Hui 5%, Kyrgyz 0.9%, Mongol 0.8%, Dongxiang 0.3%, Tajik 0.2%. At the same census, Han Chinese made up 91.6% of China’s total population. “Country Profile China”, Economist Intelligence Unit, London, 2009, p.15. 20. Carla Wiemer, “The Economy of Xinjiang”, pp. 164-8. 21. 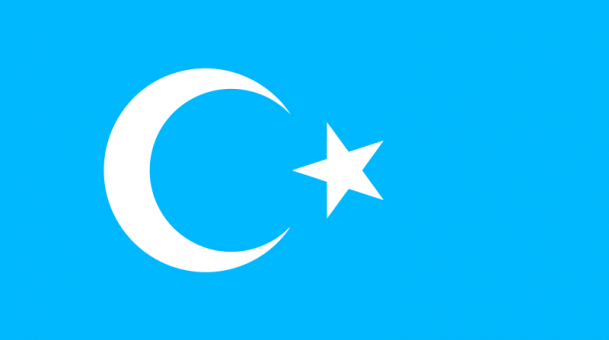 This was the Second Eastern Turkistan Republic. The first one was founded in Khotan in November 1933, as a result of the Islamist and nationalist aspirations of the Uyghur people there. However, it lasted only until February 1934 when the city of Kashgar was taken by the warlord Ma Zhongying as a part of his campaign against his rival Sheng Shicai. 22. Michael Dillon, Xinjiang: China’s Muslim Far Northwest, (London: Routledge, 2004), pp.32-6. Survey, Vol. 26, No. 7, 1981, pp. 722–723. 24. Carla Wiemer, “The Economy of Xinjiang”, p. 169. ‘Domestic-Foreign Frontier’?”, Asian Ethnicity, Vol. 4, No. 2, 2003, pp. 207-224. 26. Jack Chen, The Sinkiang Story, (New York: Macmillan Publishing Co Inc, 1977), p. 294. 27. There emerged a “floating population” of migrants from rural areas to cities, of which the number was 40 million in 1985, increasing to 140 million as of 2003. About 20 million people are added to this population every year. Consequently the level of urbanization in China began to increase, from 27% in 1990 to 36% in 2000, and to 43% in 2005. This figure is estimated to rise to 65% by 2020. Kam-Wing Chan, “Internal Labor Migration in China: Trends, Geographical Distribution and Policies”, United Nations Expert Group Meeting on Population Distribution, Urbanization, Internal Migration and Development Conference Proceedings, 2008, p. 93. 28. Nicolas Becquelin, “Xinjiang in the Nineties”, The China Journal, No. 44, 2000, pp. 71-2. 30. Nicolas Becquelin, “Xinjiang in the Nineties”, p.83. 32. Gaye Christofferson, “Xinjiang and the Great Islamic Circle: the Impact of Transnational Forces on Chinese Regional Economic Planning”, China Quarterly, No. 133, 1993, p. 136. 33. Liu Qingjian, “Sino-Central Asian Trade and Economic Relations: Progress, Problems and Prospects”, Zhang Yongjin and Rouben Azizian (Ed. ), Ethnic Challenges Beyond Borders: Chinese and Russian Perspectives of the Central Asian Conundrum, (London: MacMillan Press Ltd., 1998), p. 182. 34. The “western regions” as covered by the plan included six provinces (Gansu, Guizhou, Qinghai, Shaanxi, Sichuan, Yunnan), three autonomous regions (Ningxia, Tibet, Xinjiang), and one municipality (Chongqing). 35. These major objectives of the plan were laid out by Chinese Premier Zhu Rongji at the March 2000 session of the National People’s Congress. 36. In this article, “yuan” denotes the principal unit of renminbi, which is the official currency of China. As of 1 December 2010, one US dollar is equal to 6.68 yuan, and one euro is equal to 8.67 yuan (official rates announced by the Bank of China). 37. “Xinjiang Development at the New Starting Point”, People’s Daily Online, 7 July 2010, (http://english.peopledaily.com.cn/90001/90780/91342/7055962.html). 38. Yu Shujun, “Blueprint for a Properous Xinjiang”, Beijing Review, No. 23, 10 June 2010. Vol. 31, No. 3, 2007, p. 339. 40. Rui Xia, “Asphalt Net Covers China’s West”, Asia Times Online, 15 September 2005, (http://www.atimes.com/atimes/China_Business/GI15Cb01.html). 41. Wang Zhengyi, “Conceptualizing Economic Security and Governance: China Confronts Globalization”, The Pacific Review, Vol. 17, No. 4, 2004, p. 536. 42. “Quanguo niandu tongji gongbao – Xinjiang (2009 nian)”, China National Bureau of Statistics, (http://www.stats.gov.cn/was40/gjtjj_detail.jsp?channelid=4362&record=7). 45. Vincent Cable, “What is International Economic Security?”, pp. 313-319. 46. BP Statistical Review of World Energy, June 2010, p .9. 47. Calculated using the data in BP Statistical Review of World Energy, p. 9 and 12. 49. 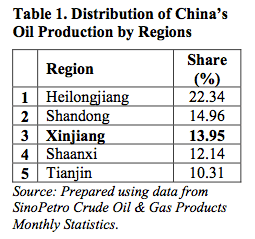 “China’s Thirst for Oil”, ICG Asia Report, No.153, 9 June 2008, p. 4. 50. Calculated using the data in BP Statistical Review of World Energy, p. 21. 51. “China Energy: Petroleum Demand”, EIU Industry Wire, 7 February 2008. 52. China National Bureau of Statistics. 53. Other basins in Xinjiang that contain oil reserves are Junggar and Turpan-Hami basins. 55. This company is a 50:50 joint venture between CNPC and Kazakhstan’s KazTransOil. 56. China National Bureau of Statistics. 58. “Country Analysis Briefs: China”, U.S. Energy Information Administration, July 2009, (http://www.eia.doe.gov/emeu/cabs/China/Full.html). 59. BP Statistical Yearbook of Energy. 60. “China’s Xinjiang Coal Reserves Adds 18.98 Billion Tons”, China Mining Federation, 8 May 2008, (http://www.chinamining.org/News/2008-05-08/1210233199d13585.html). 61. “Textile, Garment Exports to Suffer Largest Drop in 30 Years”, China Daily Online, 21 October 2009, (http://www.chinadaily.com.cn/business/2009-10/21/content_8827056.htm). 62. “China’s Textile Industry Output Rises 10%”, China Daily Online, 3 February 2010, (http://www.chinadaily.com.cn/business/2010-02/03/content_9423379.htm). 63. In 2007, the eastern part of the country contributed to 91.2% of the total trade volume, where as this figure was 4.89% for central China and 3.94% for western China (Calculated using data from China Monthly Statistics, 3 February 2008). 64. China National Bureau of Statistics. 65. In 2007, 63.9% of China’s foreign trade was transported through waterways, whereas this ratio was 24.4% for railways and 11.6% for highways (Calculated using data from China Monthly Statistics 3 February 2008). 66. “Rising Logistics Costs Threaten Chinese Competitiveness”, CER-China Logistics News, 30 April 2008. 67. “China Builds New Silk Roads to Revive Fortunes of Xinjiang”, Xinhua News Agency, 2 July 2010, (http://news.xinhuanet.com/english2010/china/2010-07/02/c_13380771_2.htm). 68. Liu, 1998, pp. 192-3.
according to which a scheduled container train (the Trans-Eurasian Express) would be shuttling between China and Germany in a year’s time. In September 2008, the train made its maiden voyage, carrying 50 containers of high-tech products from Xiangtang in China to Hamburg in Germany, a distance of 12,000 kilometers, in 17 days. In comparison, goods delivered by sea from China to Germany need around 35 days to reach their destination. Introduction of regular services by the Trans-Eurasian Express has been postponed by the German side due to the global economic crisis. “Güterzüge nach China”, N-Tv Online, 20 September 2008, (http://www.n- tv.de/wirtschaft/meldungen/Gueterzuege-nach-China-article24327.html); “Deutsche Bahn stoppt Güterzug-Verbindung nach China”, Verkehrsrundschau, 25 June 2009, (http://www.verkehrsrunds chau.de/deutsche-bahn-stoppt-gueterzug-verbindung-nach-china-852879.html).